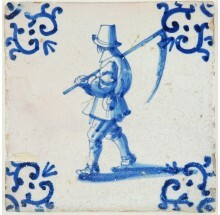 Carpenters, bakers, fishermen, painters and many other craftsmen were popular to paint on Delft tiles during the first part of the seventeenth century. Many men learned crafts that were almost litteraly performed on the streets, which is not really comparable anymore to the average job someone has at the moment. 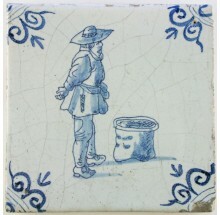 Nevertheless these tiles still live up to our imagination, taking us back to the time that many men still had the skill to craft something outstanding. 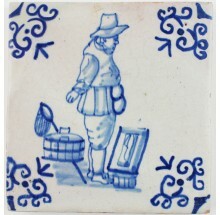 If you have any questions about Delft tiles with craftsmen or if you are looking for something specific kind of craftman, please do not hesitate to contact us. Click here to visit our contact page.